The .410 shotgun is one of the most multipurpose shotguns on the market. While not the most powerful or the most popular, .410 shells can be used in certain revolvers, like the Taurus Judge, or be paired up with the 22 rifle to add some punch to this popular small game hunting round and can also be used as a sport shooting shell. Whatever your purpose, the .410 is the choice for you. With over a century and a half of practice creating ammunition, Winchester has perfected the process. 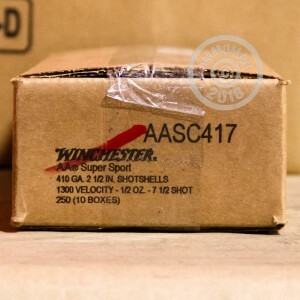 Providing America with some of the best ammunition throughout its history, Winchester has been among American's first choice for ammo since its founding in 1855. 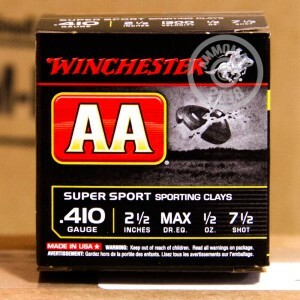 With this AA Super Sport Sporting Clays, 2 1/2", 1/2 ounce, #7 1/2 shot ammo from the beloved Winchester, you can successfully blast clay targets without developing a sore shoulder. When you experience the wonderful quality of Winchester, there is no going back. 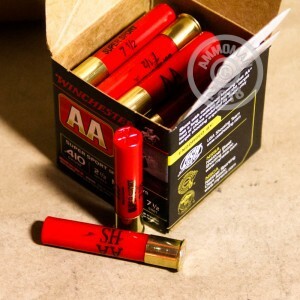 Great ammo, reasonable price, and super fast shipping.